I brought only one cookbook with me to Florida. Admittedly I have a large collection both in Lake Lure and here, but only one book from Lake Lure spoke to me to be included in the trip South. It was Sara Foster’s Fresh Every Day. I love her seasonal approach to cooking and the Southern leanings of the book. But this book is more a reflection of the new South, with twists on old Southern favorites like biscuits and cornbread. In Sara’s hands they become sweet potato biscuits and cornbread panzanella. Some things are truly Southern. 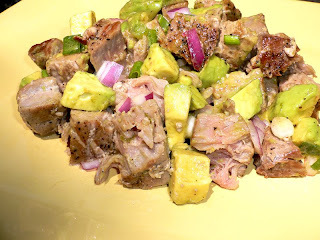 Tuna salad with hard boiled eggs and sweet pickles is one of them. 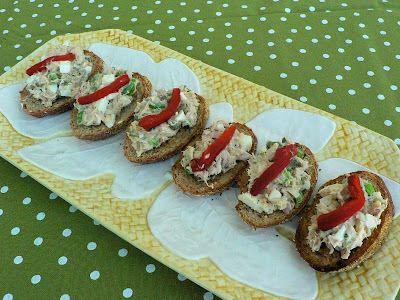 You can eat the tuna salad in a sandwich, but how about serving it on toasted crostini with a garnish of roasted red pepper. Sara has elevated a simple classic. Somehow it tastes a little better to me that way. 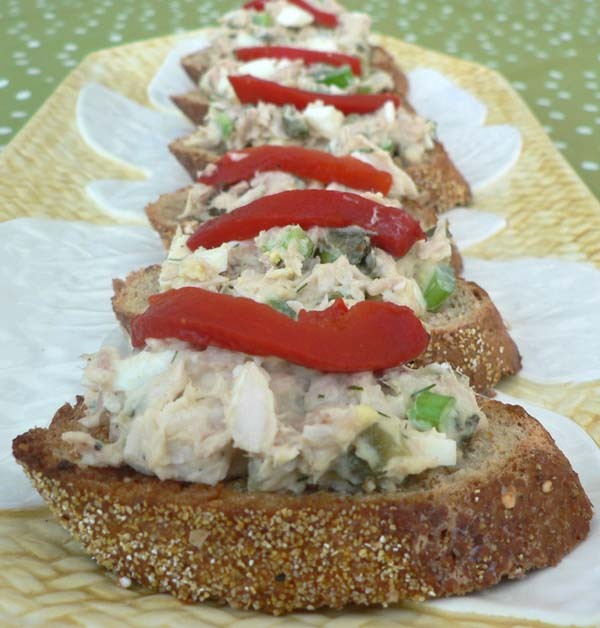 Combine the tuna in a medium bowl with the chopped hard-boiled eggs, celery, pickles, mayonnaise, mustard, dill, salt, and pepper and stir to mix. Cover and refrigerate for 1 hour or overnight. Now onto some exciting news for me. I entered a contest that is being offered by my blogging buddy Dave’s new website eRecipeCards. 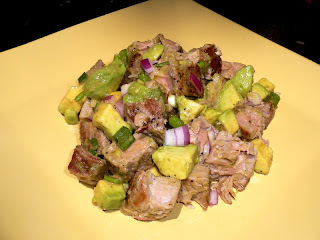 He has gone from blogging his own posts on My Year on the Grill to establishing a website where all us can submit our recipes to share with everyone. I am loving eRecipeCards.com so much. It has increased the traffic on my blog and introduced me to lots of other bloggers. It is a community of cooks both old and new. I know many of you submit your recipes to the website. Dave has even started a new blog called Inspired by eRecipeCards.com where he recreates recipes from those of us who contribute to the website. He is a very supportive guy. His first contest is being sponsored by O OLIVE OIL. 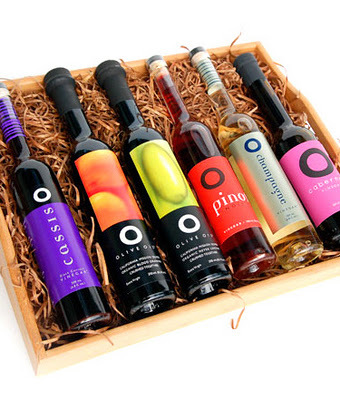 O OLIVE OIL is offering a box of their cirtrus olive oils and barrel aged vinegars to the winner. There will also be monetary prizes for best photography and best writing skills. I submitted an idea for a recipe to O OLIVE OIL and they liked what I suggested. I am one of 8 bloggers who will post a recipe using O OLIVE OIL oils and vinegars and a review of the products on December 1st. I look forward to the challenge and to your support. Posted on November 15, 2011 at 4:51 am. I would like to thank Kate of Warm Olives and Cool Cocktails for choosing the first Barefoot Blogger recipe of the month. I mean, I REALLY WANT TO THANK HER. I did not want to do this recipe. Tuna steak is not appealing to me. It is usually served red and rare and I just can’t go there. I thought maybe I would just go with a good quality canned tuna or substitute salmon. Besides I was sure my supermarket would not even have fresh tuna. So I confidently went to the market the other day and guess what! They had wild Sashimi grade tuna steaks ON SALE for $6.98 a pound. I grudgingly bought one steak for my husband’s lunch. He loves fish. I also found wasabi powder which was also called for in the recipe. Wasabi is a green horseradish grown only in Japan and the powder provides a chile -like kick with an herbal overtone according to my google search. I did make a few adjustments to the recipe. The Barefoot Contessa cooks the tuna steaks for only 1 minute per side and that is just too rare for even my husband’s taste. So I cooked the steak for at least 3 minutes per side. I did not use the amount of salt it called for in the recipe because David is on a salt restricted diet. I was confused by the amount of lime juice specified in the recipe. It calls for 6 tablespoons ( 3 limes ). There is much more juice in 3 limes than 6 tablespoons. I made half of the recipe for the vinaigrette and used 1 lime. I also added 1 tablespoon of sugar to offset the tang of the lime. The dish was simple to assemble and I tasted it before I called him away from his remodeling projects and it was good. Darn, I should have made more! It was excellent. “Oh yea of little faith”. I should have known that The Barefoot Contessa would not fail me. And that is why I thank Kate for forcing me to make a dish that I would have never attempted otherwise. I am glad I joined the Barefoot Bloggers for that very reason. Take some time to see what the other members are doing with this recipe. I am off the to the store to get more tuna while it is still on sale. Posted on May 14, 2009 at 5:09 am.